The beginning of the war in Holland occurred on May 10, 1940. At 6:00 in the morning or thereabouts, my middle brother woke up because of the sound of airplanes. He went to the bedroom of my mother and father and said, "Mommy, Mommy there are airplanes in the sky and there are quite a number of them." So my mother and father rose up and, indeed, there was a heavy drone of planes. Intuitively, they turned on the radio and the first thing we heard was that the Germans had invaded Holland and we were at war. As we looked out, we could see that the planes were dropping hundreds of parachutists who then took up strategic locations in our city. A lot of people went outside and watched the sky and didn't know what to do. We had no idea what war was about. During the next four days more planes and troops and then tanks and heavy equipment followed. The Germans invaded all of our borders. By Tuesday, May 14, they gave Rotterdam an ultimatum to surrender or be bombed. News of our capitulation reached the enemy in time but, nonetheless, heavy bombardment started about 1:45 in the afternoon. Rotterdam had been designated an "open city" (as later was the case with other cities such as Paris and Rome) and I don't know why the Germans bombed. That was against all codes of warfare. But they did a lot of damage. They bombed in a pattern so that they could take the center of the city and then spread out. The bombing stopped about half a mile from where we lived in the north. Though they only bombed Rotterdam one time, it was in great force. Because we lived in the north of the city, we went outside and witnessed the first of the bombardment. I can still see the Heinkels, and hear the sound of the bombs, whistling down. Short whistling meant real danger, while long whistling meant the bombs were further away and we were not in danger. This whistling-siren sound was terrifying and the accuracy of the bombs was amazing. The Germans were able to pinpoint their targets almost perfectly. Thus, they left all of the railroads intact and also the structures of almost all of the buildings belonging to them. For at least three days the inner city was pitch black because of all the smoke and dust. You couldn't see anything even though the bombing lasted for only a few hours. Holland officially surrendered on May 15, just five days after the first planes had appeared. About 40,000 people lost their lives and the heart of Rotterdam was in shambles. We were especially sorry that our beautiful cathedral, the Sint Laurens-Kerk, had been bombed. Shortly thereafter, a big sign appeared in front of it: "Under the Protection of the Führer." About 1980, it was rebuilt. The cities of Hamburg, Bremmen and Keulen gathered moneys and laborers to restore it, as a "Love Gift of Germany." On May 14, at the beginning of the bombardment of Rotterdam, a lady came walking along (she had sort of a German accent, now why that was I don't know) and she asked if she could just stay in our house while the attack was going on. Once in, she directed us to sit on the bed and place cooking pans on top of our heads. If something happened, our heads would be protected. I remember the whole family sitting there. We just got hysterical, laughing. It was such an odd sight to see somebody with such a thing as a turkey pan on. When the first scare and raid were over we decided that this whole thing was ridiculous and the lady went on her way. Actually, what she had wanted was to take the mattresses off the beds and lie under them. After the bombardment, I recall going to the streets. One in particular, Jonker Frans Straat (Young Gentleman of France Street) was totally in flames. Most stores and almost all other things were burning. Owners whose stores were not yet in flames but who believed they soon would be (flames were coming from all directions) decided to open their doors so people could get whatever they wanted and carry it off. I saw people with, you name it, they had it. That was an oversight since many of those stores actually never did burn and the owners tried to get their merchandise back. But that was almost impossible. On another occasion right after the bombardment, in one of the churches that was bombed out, the organ was miraculously still working and there was a German officer playing Bach preludes and fugues. It touched me very deeply. I mean it was a real wreck of a church but he played the organ. Now you can't tell me that man was altogether bad. He made distinctions, too, as did everyone. Every country has its good and bad. For Holland, the bombing of Rotterdam was the first major event in the war. However, because the Germans were already in Poland, because England and France had declared war on Germany on September 3, 1939, and because Holland had been previously infiltrated by many well-informed and well-directed pro-German people, we had known it would only be a matter of time before we would be invaded. We had been continually on "red alert." Furthermore, when the Germans invaded Holland, they also attacked Belgium and France. Though we had known war was coming, we really didn't know what to do. There was no such thing as trying to get our basements full of groceries. But there was no actual panic that I could detect. Our Army (Leaer), Air Force (Luchtmacht) and Marines (Mariniers) were heavily armed and ready and did engage in some fighting. But they couldn't stop the Germans. German war materials and man power were much too advanced and they were able to implement Blitzkrieg, "lightning war." So when Rotterdam was bombed that was sort of the end, or the beginning of the end. It was rather useless to fight back. We were bewildered, and we didn't know what to think about it, how long it would take. We didn't know what was in store. Queen Wilhelmina and the Royal Family weren't surprised by the attack, however. On May 14, before the aerial bombardment, they fled to England. I believe they were picked up by an English submarine. This was a source of resentment for many Dutch citizens. For others, opinion was divided as to whether they should have stayed in Holland or should have warned the Dutch people. Nonetheless, from the safety of England, Queen Wilhelmina made broadcasts to the Dutch citizens, many times, to fight for the war effort. I remember those vividly, just as I remember, when I was kid of six or seven, standing on the street for an hour or more to catch a view of the queen coming by. She was almost like a religious symbol. (My mother held her in very high esteem.) But I always found it rather strange to give so much emphasis to waiting and waving flags for a four-second view. Though as ordinary people we were not able to do much to prepare ourselves, the NSB (pro-German people, i.e. National Socialist Movement or Nationaal Socialistische Beweqing) had been well informed. One part of their dirty work entailed filling the second of two fuel tanks on our G.1 planes with water. Once in the air, trying to ward off the Germans, our double-tailed planes actually fell out of the sky when the second of the fuel tanks became engaged. Another common NSB activity was to disable bridges. Indeed, the NSB did many things to generally help the German Army establish itself in Holland. I was born in Rotterdam, March 12, 1931, to Berend Louis Hut and Johanna Maria Quellhorst Hut. My parents had also been born in Rotterdam so we were real Rotterdammers! I also had two brothers: Jan (pronounced "Yun") about 6 years older and Leen (pronounced "Laine") 4 years older. Our original surname was Von Hutten which means "the protectors," or "care takers" in German. Basically, it came from northern Europe to Holland during the great period of religious upheaval between the Catholics, Lutherans and others (c. 1500-1600). "Hut" is a very well-known name in northern Holland. There are literally hundreds of Huts, much like "Johnsons" or "Smiths" in the United States. My father worked for the opera house (De Grote Schouwburg) as stage manager and designer. He was in charge of making sure that stage settings and costuming balanced perfectly with musical historiography and the choreography of all operas that were presented. He and the seven people he directed made much of the furniture. Costumes were made elsewhere to their specifications. He was always gone, often in the middle of the night, because he had to be at the opera when there were performances. Though he could alternate with another person, he felt he himself must be there. If something went wrong, the manager was needed. He had a lot of stories about the different opera companies and their peculiarities, especially in terms of what they needed for the stage. My mom attended almost all of the operas. I went sometimes and sat there listening. My parents were always playing opera at home so we had a good background in it, much to the dismay of my brothers who didn't like that type of music at all. Nonetheless, I was very fond of it and think it may have awakened the germ cell of my own musical intuition and prepared me for later life. My brothers were sort of "with the time" -- whatever was popular then, that's what they sang. I remember them always yelling out, "Mexicalli Rose Stop Crying," and those old tunes from the Kilima Hawaiians, whereas I would listen to piano and harpsichord music. I was very different from them so we had a battle about the radio. There was no television of course, but there were many radio stations. In our home, we always had many guests because my mother was very outgoing and entertaining, and made great coffee! Appointments or formal invitations were unknown. Neighbors just came, took off their shoes, sat a spell, visited and had coffee. Many, many nights, though my parents did not drink, our guests would have a stiff shot of borreltje (gin). But nobody ever got drunk in our home. Drop-in visiting was common in Holland. (Though very well-situated people and businesses had phones, I don't think it would have made much difference if we had had one.) In our home, my mom was the conductor, so to speak. She was a real intellect and was also extremely witty so she usually set the tone for all conversations. People always had a lot of fun. I can't really recall a whole lot about my earlier childhood except that we moved around a lot and dwelt in Rotterdam Noord, one of the poorer sections of the city. There was Crooswijk which was really poor! So we were not the poorest, but we certainly didn't have electricity, telephones or cars. Mostly it was still horse-drawn wagons. Before the war broke out in Holland, there were periods when it was hard to make a living. We certainly didn't live rich. I remember we had one spigot of cold water. So in order to take a bath, once a week, we walked to a little convenience store called a water stokery where there was a great big tank of boiling hot water (if you managed to arrive before everyone else). In order to bathe, you had to carry two buckets full. I remember that one bucket cost three cents, a loaf of bread five cents, and a chocolate Dixie cup from Jamin, two and one-half cents. The storekeeper, Mr. Klippel, kept a ledger and we paid at the end of each week. One time I lost a gilder (about 25 cents) en route. It was all of the money we had so my family and I went looking for it, desperately, in the snow. Seeing our plight, our neighbors soon helped in the search, but it was all to no avail. We had nothing, we were really poor. Our only possibility for obtaining some more money was to go to the lommerd (pawn shop). Among other things that we hocked, I especially remember my parents' golden wedding rings and my father's one good suit. Sometimes we were able to buy things back, but most often our treasures were gone forever. We took our baths in the kitchen! - in a big, gray galvanized metal bucket called a teil ("tile"). We each bathed on a different day, using handmade soap of lard and lye that stank like crazy, and we always carried our own water. One pair of socks and underwear had to last for the bath week. If anything became soiled earlier, my mother would say, "Throw it up to the ceiling. If it sticks, I'll wash it." Bath day was a great event! After the war years, my dad installed a shower outside in the yard in a little cabin and the whole neighborhood came, for a quarter, to take a shower. His was the first shower on the street. It's really true. There were other bath houses located about 16 blocks away, but they were generally for arbeiders (lower class laborers) and you had to wait in line. Some city blocks never did have a shower. Since we didn't have electricity, we had gas lights. They used "socks" (or mantles) which had to be attached to gas jets within the light fixtures. When the gas came into them, they provided a sort of enclosure in which the gas could burn and give off light. They had to be ignited with matches and were very fragile, being made out of a silky woven mesh material. If you touched or moved them or did anything at all, they would go ka-poot in no time, and fall apart. Nonetheless, we put them on and they burned, but they were miserable. Our neighbor, Willem Langeveldt, had an old French upright piano. I continued to be very interested in music, and I loved Mr. Langeveldt. 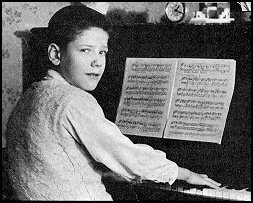 So in 1943, he became my first "teacher," though he himself knew how to play just a little bit and have fun with it. (He was nowhere near a piano teacher.) Nonetheless, he worked with me and let me practice at his house as long as I did the dishes, changed diapers, went for groceries and so on. In 1944, Mr. Langeveldt's brother Koos, who was an accomplished pianist, also advised me. Later that year we rented a piano for our home. In 1945, I began lessons with Tom de Boer under whom I learned the Haydn Symphonies. The cost of one lesson was one potato! And I had to keep that potato well hidden en route.